Effective February 2018, Disney World raised its theme park ticket costs in what has become an annual tradition. In 2016, the theme park resort introduced variable pricing, which made an already confusing menu of tickets much more baffling. Relax. I'll help you wade through and make sense of all of the options and help you get the best deal for your next visit. First, the bad news: The cost for a one-day, one-park admission to the Magic Kingdom has gone up to as much as $129 Ouch! That's not chump change. It's critical to understand how the program works so that you can make an informed decision and maximize your savings. Before we jump into ticket pricing and buying strategies, it's important to note that regardless of the tickets you end up purchasing, you are going to want to link them to what the resort calls a "My Disney Experience" account so that you will be able to make ride reservations and plan your trip. There is both an online Web site and a mobile phone app that you can use in advance of your visit and while you are at the resort. It can be confusing, but it's important to understand the different elements of Disney World's trip planning resources, including FastPass+, MagicBands, and My Disney Experience. Following the lead of Universal Studios Hollywood, Disney World switched its 1-day passes (and only its 1-day passes) to a variable pricing model starting in 2016. It's similar to airlines and hotels, which charge more, based on demand, during peak seasons. The practice is also known as "surge pricing." The resort has assigned three categories for 1-day passes: Value, Regular, and Peak. As the names imply, Value tickets cost less during lower-attendance times of the year such as September, while Peak tickets cost more during busy times of the year such as spring break, early summer, and the days leading up to and following Christmas. One way to save on 1-day tickets would be to visit during the Value seasons. In addition to saving money, you'll enjoy less crowded parks. Regardless of the time of year, a 1-day ticket to the Magic Kingdom, Disney World's most popular park, costs more than 1-day passes to the other three theme parks. To learn which days fall into the Value, Regular, and Peak categories, and to purchase tickets, go to Disney World's ticket page. Yes, multi-day passes have gone up. However, multi-day tickets, particularly the 5- through 10-day passes, still offer substantial savings. An 8-day Disney World ticket with "Park Hopper Plus," which includes unlimited admission among the 4 theme parks for 8 days plus 8 visits to any combination of the resort's two water parks, a round of golf, a round of miniature golf, or Disney's Wide World of Sports Complex, costs $525. (All examples included here, unless noted, are based on tickets for ages 10 and older. Tickets for ages 3 to 9 cost less; children under 3 are admitted free.) That's about $66 per day, which is fairly reasonable considering all of the options. A comparable 10-day pass costs $545, just $20 more than the 8-day option. That brings the per-day cost down to $54.50, which is a pretty good deal. Of course, the Disney folks are no fools. Guests staying longer on their property will spend more money for hotels, food, and merchandise, AND they won't be escaping to Universal Orlando to visit The Wizarding World of Harry Potter or other nearby parks. BEWARE, however. Unlike Disney's unused tickets from years ago, which were good indefinitely, current tickets expire 14 days after first use. And effective 2015, Disney World no longer offers visitors the opportunity to purchase a no-expiration option for multi-day passes. Therefore, you should only buy passes for the number of days you would actually be able to use them for an upcoming visit. Note also that passes are non-transferable, so be sure that each member of your party has his or her own ticket. Note also that unlike past Magic Your Way pricing, Disney is NOT offering any discounts for purchasing tickets online in advance. The prices online are the same as the prices at the ticket booths. (And, if you were to choose to pay for express shipping—a free will call and standard mail option is available—the price would actually be higher.) You would, however, be able to save time by purchasing tickets in advance. And you would be able to carefully consider the options rather than making a rushed purchase. Are you confused by the different terms and options that Disney World offers? Let's break them down. Base Ticket prices are for one-day, one-park tickets. The $305, 3-day option for example, gets you one park each day for three days. With the Park Hopper option, you could visit multiple parks each day. For instance, you could go to Disney's Animal Kingdom in the early morning (when more animals are likely to be visible), the Magic Kingdom in the middle of the day, and cap off the evening with Fantasmic! at Disney's Hollywood Studios. 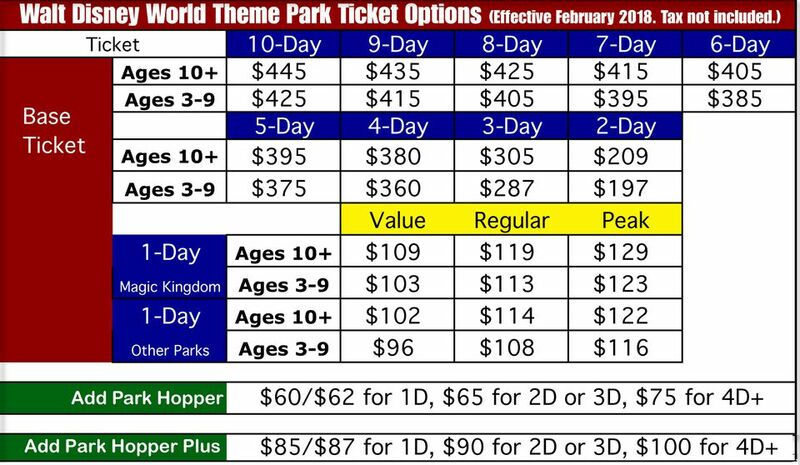 The Park Hopper cost above the Base Ticket price varies. It is $60 or $62 more, depending on whether it is for a Value, Regular, or Peak ticket, for a one-day pass. A 2- or 3-day Park Hopper is $65 additional. It is $75 more to turn all 4-day or higher tickets into Park Hopper passes. Park Hopper Plus adds admission to Disney's wonderful Blizzard Beach and Typhoon Lagoon water parks as well as Disney's Wide World of Sports, a round of golf at Disney's 9-hole Oak Trail Golf Course or the resort's two (charming) miniature golf courses. The costs vary depending on the time of year and the number of days you would be visiting the parks. The number of Park Hopper Plus visits starts at 2 for 1- and 2-day tickets and increases to 3 for a 3-day ticket, 4 for a 4-day ticket, etc. up to 10 for the 10-day ticket. Again, discount Disney World ticket seekers, the higher the number of days, the greater the value. Keep in mind that you can purchase a-la-carte tickets to the water parks and the other attractions instead of springing for the Magic Your Way Park Hopper Plus package. We'd all like to find reduced prices on Disney World tickets, but unlike most other parks, the Mouse does not directly discount its passes. By raising the 1-day, 1-park ticket price to a staggering $129 for the Magic Kingdom, Disney is really putting the squeeze on our pocketbooks and making the 1-day option nearly cost-prohibitive. At the same time, its multi-day ticket pricing, particularly for 5 or more days, offers considerable value. What would make the most sense (and cents) for you? Clearly, if you are a huge Disney fan and are planning to spend 10 days or more on vacation, a 10-day ticket with the Park Hopper Plus add-on would be the way to go. But most folks based in the U.S. don't spend 10 days on vacation (their European counterparts, however, often spend 2 weeks or more on holiday) and, as much as Disney might wish otherwise, there are other wonderful Florida theme parks to visit. Also, there's more to vacations than theme parks (and that pearl of wisdom comes from About.com's Theme Parks "Expert," no less! ), so you might want to explore other things to do in the area. If you are planning to spend 1 or 2 days at Disney World, the Park Hopper option would make sense. Disney didn't offer 1- or 2-day park hopping before 2005, and the option would allow you to visit all 4 parks in 2 days for $274, or about $68.50 per park. If you started early in the morning and stayed till the last park closed each day, you'd be getting an OK deal (and tired feet). Note that Florida residents (who must show proof of residency) get a break on ticket costs. If you want to visit the water parks or any of the other non-theme park attractions, the Park Hopper Plus might be the way to go for longer stays and multiple visits to the attractions. You could certainly get a great value if you went to the water parks or attractions every day of your visit. But would you do that? If you're only planning to go once, say to one water park, the extra cost would not be worth it. You could purchase a-la-carte tickets to visit one of the water parks for $65 and be ahead of the game. Two tickets to the water parks, however, would cost $130, so regardless how much the Park Hopper Plus option would cost you, it would make sense to buy it for guests planning to visit more than one water park or additional attraction during their visit. Why anybody would get the Park Hopper Plus option for a 1- or 2-day ticket is beyond me. Even the most proficient multitasker would find it challenging to visit multiple theme parks plus water parks or other attractions in a couple of days.